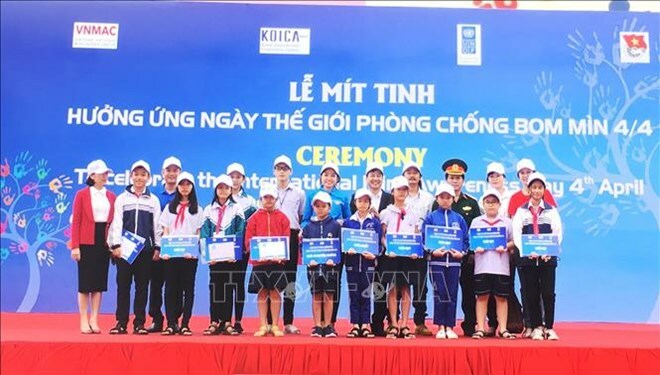 Quang Binh (VNA) – A meeting and a series of activities in response to International Mine Awareness Day (April 4) was held in Dong Hoi city, the central province of Quang Binh on March 24. Vietnam is one of the countries hardest-hit by bombs, mines and explosives left over from the war. According to data, up to 6.1 million ha in the country are contaminated by bombs and mines, accounting for 18.71 percent of the total. Post-war unexploded ordnances (UXO) are scattered in 63 cities and provinces, mostly in the central region. All wards, communes and districts in Quang Binh are contaminated by bombs and mines with a total area of nearly 225,000ha. Over the past decade, 164 bomb and mine accidents in the locality have killed 49 and injured 115 others. Thousands of residents have become disabled during their life due to limited awareness of UXO. Tran Huu Thanh, deputy head of the Vietnam National Mine Action Centre’s planning and coordination office, said response activities aim to call on socio-political organisations, individuals at home and abroad to deal with the consequences of post-war bombs and mines. A contest on bombs, mines and prevention and a parade along major streets in Dong Hoi city were also held. In particular, a painting contest, themed “For a safe community without bomb and mine accidents”, attracted 100 children aged 8-15.